It turns the stomach, the kind of email Marlene sent me over the weekend. Marlene who runs the cooking site CooksKorner said that one of Ruhlman’s Twenty recipe testers, Matthew Kayahara, had done a 4x recipe of the cookies in the book (page 161), the basic cinnamon-sugar cookie, and it was badly out of whack. Indeed, when Marlene checked what was in the book, she found that the published recipe contained three times the amount of granulated sugar it should have. It’s a book writer’s nightmare. It also reminds me what a great thing an ebook is or an app that updates on your device automatically. But there is some small recourse. I can announce the error here and publish a correction. Here it is, the tested and true snickerdoodle recipe, based on one sent to me by Shuna Fish Lydon, which I could have included in either the dough chapter or the sugar chapter. I love that it’s so simple and results in a really pleasing cookie, with crisp edges and exterior and a slightly chewy interior. For an easy afternoon snack for the kids (these are great milk-dipping cookies), this is a quick and easy fix. I do these in a bowl by hand but you can double the amounts and use a standmixer with a paddle attachment if you have one. And by the way, Marlene has a forum devoted to the book, for people who want to cook from the book, share experiences, ask questions, rant at me, or what you will. Please have a look at her link (above) and scroll down to The Twenty Forums. Preheat oven to 350 degrees F./180 degrees C/gas 4. In a small bowl, combine the flour, the baking power, and a three-fnger pinch of salt. Fold in the flour mixture, in a few batches, into the butter mixture until completely incorporated. Sprinkle the cookies with the cinnamon sugar (save any leftover for cinnamon toast!). Bake until the cookies are cooked through, and the edges are golden, about 15 minutes. Sprinkle with more sugar if you wish. Yield: about 12 medium-sized cookies. My post on cookulus a baking app. Wasabimon, aka Stephanie Stiavetti shares her recipe for french canneles. The Decorated Cookie Blog has some great creative ideas and recipes for cookies and other sweet treats. Should there be an “is” in the last sentence of the first paragraph? Maybe I’m not reading rightly; sometimes, my english is not so good yet. Dropped by Omnivore Books and your book caught my eye immediately (it was on a table by the door). Very catchy. And then I saw your name. Had I not been overloaded (and prioritizing out-of-print books) would have grabbed one on the spot. Instead, Amazon. Thanks for reminding us all (readers and authors alike) how dead easy it is to overlook a mistake in recipe text. Your eyes start to glaze over and the words stream effortlessly by. I’m in the retesting phase now, and am taking each recipe one by one (“until there were none”). Good thing I’ve got my little students to eat what I cook and provide honest feedback (though “thank you for cooking, Nancy…it’s so, so yummy” may not consistent as honest feedback, it is nonetheless delightful to my ears and a constant incentive to cook again). good to hear from you nancy! good luck on your book! Going to the kitchen with a pen right now! I think you corrected in the wrong spot. I tried the Cookulus app and was very pleased. Can’t wait to see their app on Snicker Doodles (if they do one). 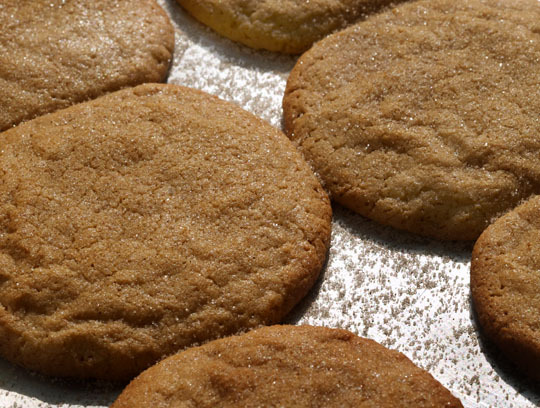 In junior high, a woman, then a girl, gave me her snicker doodle recipe that used shortening instead of butter. You rolled the dough into walnut sized balls and rolled them in the cinnamon-sugar mixture. Finally, pressed the coated balls with the bottom of a glass as above. We had many afternoons of fun making these cookies. Sorry to hear about the error. You have corrected it here and on twitter. Ok, I’m confused. The cookie ratio is 1 pt sugar: 2 pt fat: 3 pt flour. I know you said that creates a shortbread type cookie, and the drop cookies we’re used to are 1:1:1. This, however (if my math is correct), is 1 pt sugar: 1/4 pt fat: 3/4 pt flour (I’m rounding). Am I missing something, or are the ratios really just that flexible? And if equal amounts of sugar, fat and flour give you a “very rich chewy cookie” (page 41 of the hardcover copy of Ratio) that’s also “very thin [and] crisp” (page 43, in the description for the chocolate chip cookies–how can it be both, by the way? ), what happens when you take the ratio to the point where the sugar is the dominant factor, instead of the smallest, as in the original ratio? I love that you wrote the weight measurements as well. I wish every cookbook author adopted this feature. I put off baking because of the amount of measuring spoons and cups I have to clean each time. There is a product on the market sold only in the States and whenever I can get it for baking, I do. However, being Diabetic my sweet tooth palate is not so good and I would love for a true baker to test it and give a really truthful opinion and if that could be you Michael or any one of your readers…the product is called DiabetiSweet and is not imitation sugar or splenda…it can be googled for its components but it is not cheap…I love to use it and can find no aftertaste and it does replace sugar as it says…so here’s to the person willing to test it spoon for spoon…coffee will be on me..I fell upon this product many years ago and I swear by it but as I said; I don’t have the palate. Can I tempt you Michael for a taste test for your Diabetic friends? and or their friends? More CIA handtowels on Opensky PLZZZZ. I keep checking and they keep saying ‘sold out’. Sorry, had to post this here because I don’t have a FB account and opensky requires one to comment. Which is annoying. Love the recipe. And the weights and measures. Thanks. just add some glucose to the messed up recipe…. probably have a nice tuile…. If I want to make them choc do I have to adjust any other ingredient to do so ? ?